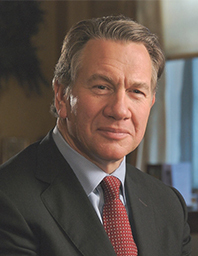 Michael Portillo gained a first class degree in History at Peterhouse, Cambridge. When he left Cambridge he worked for a year at a shipping company. He moved to the Conservative Research Department in 1976, where he spent three years. At the General Election in 1979 he was responsible for briefing Margaret Thatcher before her press conferences. For the next two years he was special adviser to the Secretary of State for Energy. He worked for Kerr McGee Oil (UK) Ltd from 1981 - 1983. He contested the Birmingham Perry Bar seat at the 1983 Election. Michael returned to politics as a special adviser to the Chancellor of the Exchequer (Nigel Lawson) and in December 1984 won the by-election in Enfield Southgate and represented the seat for thirteen years. As a member of the Government, he was a whip, Parliamentary Under Secretary for Social Security, Minister of State for Transport, Minister of State for Local Government and Inner Cities; and as a Cabinet Minister was Chief Secretary to the Treasury, Secretary of State for Employment, and Secretary of State for Defence. Later he also turned to journalism, writing about walking as a pilgrim on the Santiago Way, and working as a hospital porter. He had a weekly column in The Scotsman. He had a three part series for Channel 4 about politics Portillo’s Progress, and a programme in BBC2’s Great Railway Journeys series, which was partly a biography of his late father, and radio programmes on Wagner and the Spanish Civil War. He has also made a number of television programmes for BBC2.